It can be difficult for anyone to maintain a healthy active lifestyle. For families living with lower income levels struggling to make ends meet, unfortunately achieving this without some form of support from the community is nearly impossible. It is crucial that children and youth have access and opportunities to be active in order to acquire and build both the skills and confidence that can lead to healthy lifestyle habits. Burlington Foundation has given grants to the Reach Out Centre For Kids (ROCK) in support of their Healthy Active Living program for children in the Our Community Cares program. This program operates in lower income communities, providing free of charge after school programs, March break and summer camps for children and youth in the neighbourhoods. 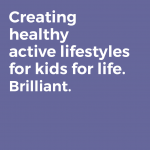 The three components to the Healthy Active Living program are sport development, recreation and life skills. Each year, the program serves approximately 280 youth. In the sport development component, boys and girls are acquiring leadership and cooperation skills with their peers and coaches. This component focuses on instruction, drills and games to improve skills in sports ranging from basketball to floor hockey to swimming. Thanks to generous equipment donations From the Canadian Tire Jump Start and the free skate sharpening from the local Canadian Tire, the students were even able to enjoy skating through the winter. The recreational component is a favourite for many children since it involves classic games at the park including manhunt, capture the flag and dodge ball. The dual focus is on fitness and fun. This encourages children to see fitness as a fun lifestyle choice that doesn’t have to be tedious or a chore to complete. Life skills are an important component of the ROCK program. The children get hands-on experience in healthy eating and cooking. Youth learn to budget, plan and prepare meals for the group. It is a great way to improve problem solving skills and the kids get tips from local Longo’s chefs. Grant money has been allocated to healthy foods and transportation to ensure all students have adequate support while attending the program. The grants from the Foundation are giving children the opportunity after school to enjoy healthy food and great sports programs in a safe, supportive environment.